In digital learning environments tablets offer unique pedagogic opportunities. Today many schools have introduced tablet-based classrooms, with Android emerging as the technology of choice. However, without effective management they can easily become a teacher’s worst nightmare, disrupting, rather than aiding learning. 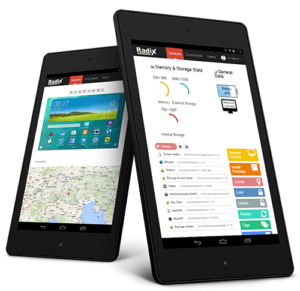 Radix SmartClass software, uniquely for the Android-based classroom, fully facilitates teacher monitoring and control of student tablet activities. Radix SmartClass is based on the Wi-Fi network of the classroom with no server or internet connection required. Students enter the class and work from their designated tablet. The teacher has their own laptop or tablet with the Radix SmartClass management software installed on it. The students simply connect to the class by selecting the teacher’s name or the name of the class they need to join. Wi-Fi connection means SmartClass fully integrates with and enhances whatever existing technology and pedagogic approach the school has. Whether a 1:1 initiative, whiteboard or tablet storage carts being moved between classrooms SmartClass is instantly available and seamlessly integrates with class teaching: No user registration, account setup or purchasing/installing of infrastructure, software, 3rd party devices or middleware required. Screen broadcast: Broadcast teacher’s tablet screen to student tablets. Collaborative interactive whiteboard: Open a virtual interactive whiteboard in students tablets, enabling simultaneous collaborative work of the teacher and the students on the same virtual whiteboard. scheduled to be locked at certain points during the lesson for a frontal discussion, and then released, with a web page sent to all tablets, together with activity guidelines. One student screen can be chosen to be shared with the class for demonstration. Remote control: Control students’ tablet screens remotely. Student demonstration: Broadcast and share selected student screen to the class. Students thumbnails: View student screens in small thumbnails on teacher’s device. Slide-show: View a cyclic slide-show of student screens and set the cycle interval. Chat: Group and individual chat and discussion center. Remote messages: Send on-screen pop-up messages to the class. Lock screens: Teacher can lock the tablet’s screens for attention, displaying a message at the top of the screen. Block Internet: Block the web browsing on students’ tablets. Lock application: Select applications from a list and lock them from future use. Co-browse: Launch and enforce a web page remotely and co-browse the internet with the class. Send and collect files: Teacher can send files to and collect files from the students’ tablets. Password protect student: Protect the student application from being stopped or uninstalled by using a password. Password protect teacher: Protect the teacher application login and launching by using a password. Log-on/off: Remotely Log-off and Log-on students tablets. Shut-down: Remotely shut-down and restart students tablets. Remote install: Remotely install applications on student tablets. Set student name: Teacher can set a student name remotely. Attendance: Save the attendance list as a text file. Hand raise: Students can electronically raise a hand for attention. This makes the software multi-way, allowing the students to contribute, ask questions and request assistance. This takes place discretely between the student and teacher, allowing students to feel much more comfortable to ask for help and guidance. The teacher can answer or even remote control the student’s screen to assist. • Classroom selector: Student can select the class to connect. Peer-to-peer: Simply connecting to the Wi-Fi to work without requiring any extra hardware, server or software. The tablets themselves become the matrix of the classroom, with no barrier between the classroom technology and the students. This creates a very reliable, convenient and cost effective solution for schools. Unified interface: All teacher functions are operated from a single very easy-to-use interface. Teachers don’t have to toggle between different applications to get everything done, whether monitoring, collaborative whiteboard work, file distribution, locking internet or tablets, quizzes and more. This not only makes life simpler for teachers but also saves precious class time. Moodle plug-in: Plug-in with the schools Learning Management System (LMS). This means that all student details can be seen from the software, for example integrating test results with the student account. Here SmartClass provides the option to connect with a centralized server in order to combine pedagogic and administrative information, effectively functioning as a platform to update or add learner information to the LMS. Easy logistics: Install teacher and student app on the same tablet.